Adventure beckons - which one of Uluru's moods best suits you? (photo: Elisse Hassey). 4:45am – yes, in the morning! … and someone’s palms are greased with sweat. “No, I feel great,” he insists. His words hang in the air; a blatant lie. I decide to let it slide. We’re in our flatteringly-lit hotel lobby, my boyfriend and I, waiting for our early-morning transfer to Ayers Rock Airport. We’re about to board a plane, but we’re not leaving the area. Aside from handling the area’s arrivals and departures, the airport is home to the area’s light aircraft services, which includes joy-flights around the region, helicopter rides over the rock and, for those brave (or foolhardy) enough to sign their heart rates away, another option that’s only very recently joined the menu: skydiving. An unexpected delight is waterfalls on Uluru when it rains. It all sounded terribly romantic, this idea of a lifetime experience at a lifetime destination, but the reality is proving slightly more… clammy. The boyfriend wipes his hands on his shorts again. We are not the only ones looking wide-eyed at this hour. Chefs, guides and concierges have already begun their days, rising to start work beneath a sequinned sky while Uluru casts an indigo shadow on the horizon. As our minivan pulls away from the kerb, an early-bird pair of tail lights glows ahead of us on the road. Someone else is off on an adventure too, it seems. Countless articles have been written about this place; most extolling the majesty and grandeur of the rock. Uluru is a crowd pleaser, it’s true. But it’s only one of three enormous masterpieces in this natural art gallery, and the other two are all the more enjoyable for their surprise factor. Indeed, it is often nearby Kata Tjuta – a collection of 36 heads (formerly known as The Olgas) that rise, with poetic grace, even higher than Uluru – that steals the most breaths. Kata Tjuta (formerly the Olgas) rises higher than Uluru (photo: Elisse Hassey). Flat-topped Mount Conner, a close cousin in the looks department to Uluru (though a mountain, as opposed to a monolith), completes the magnificent triad, and though it’s best known for generating great excitement in first-time road trippers (locals have named it ‘Fooluru’ for this reason), it has plenty of its own unique delights, too. While we’re sitting through the pre-jump safety briefing, head chef Shonaugh Moss is pulling her day’s batch of jam drops out of the oven. Uluru view: Longitude 131 (photo: Elise Hassey). The daily treats, baked under strict guidelines of a Country Women’s Association recipe (and made with a ‘red centre’ of wild rosella jam and native spices), are left in suites each morning at ultra-luxe glampsite Longitude 131°, a mix of wholesome baking and Australian humour for guests to enjoy beneath the suites’ gauzy cream tent ceilings. The mini-resort has been at the top of travel wish-lists since first opening a decade ago (though global interest reached new heights when Oprah, and then Prince William and Kate stayed here) – you could say capturing the sense of place is something they do rather well. Uluru is never far from view when you stay at Longitude 131 (photo: Leigh-Ann Pow). But most guests aren’t lying around, enjoying the view of Uluru, which sits at a tactful, but spectacularly intimate distance through floor-to-ceiling windows at the end of each tent’s four-poster bed. By the time today’s jam drops have cooled, the resort will be in full swing; the early risers enjoying breakfast and the earlier risers already exploring nature’s wonders by plane, train, bike, hike or chopper. And the rock will have changed colour, from a periwinkle haze to the palest apricot; the visual translation of a desert yawn. As our small plane floats off the ground Uluru has changed yet again; blushing coral as the rest of the day unfurls in a pink swirl of morning air and sunlight. It is a beautiful view. Even if one has a slight sick feeling in their stomach. Elsewhere, a fortunate couple is standing on top of Mount Conner, admiring the same landscape from a rather different vantage. Though the mountain is best known for its similarity to Uluru, its natural beauty has sparked a burgeoning tourism industry (as well as several proposals, and even one mountain-top wedding). This particular couple has booked the sunrise helicopter experience to the rugged terrain on top of the mountain. He is taking full stock of the breakfast hamper, eyeing off freshly baked wattleseed scrolls, freshly cut fruit, warm breakfast tarts and freshly squeezed apple and pear juice (her preferred flavour). She is listening to their pilot detail their landing on the edge of the mountain top’s wild, scrubby terrain. In a moment they will clink glasses of Louis Roederer; in another moment he will descend on bended knee. (She won’t say no.) A different kind of adrenaline is running through our small plane cabin. “See over there?” says Sam McKay, owner of Skydive Ayers Rock, and of the harness reassuringly roped through mine. A series of mountains, knotted along the hazy horizon, glimmer in the distance. “They’re in Western Australia. If ever you’ve wanted to skydive – something I’m not so sure about, at this precise moment – this place would have to be top of the wish-list. Wouldn’t it? McKay certainly felt that way; he spent a year battling red tape to get his business up and going, although just six months of operation has already rewarded him with a steady stream of customers. It seems the idea of ticking off one bucket-list item while visiting another is too alluring to refuse. “Are you ready?” Sam shouts, but my answer is lost to the wind and it doesn’t matter anyway, because all of a sudden we’re free falling so fast my cheeks are positively flapping, and I’m fairly certain I left my stomach back in the plane. But this is happening, and for all the adrenaline screeching its way round each corner of my body there’s time enough to notice Uluru below, looming large like a rich man’s belly. Terror turns to amazement, and then endorphins kick down the doors with gusto. This is brilliant! Skydiving Uluru – is this the best way to see the rock (photo: Elisse Hassey). “Pass me the tomatoes?” asks Kimberley McDonnell, happily. Kulata Academy Café doesn’t open for another 54 minutes, but the 20-year-old is already prepping for the upcoming lunch rush. She’s one of several indigenous trainees earning her stripes – and a certificate in hospitality – here; at the end of her year-long course, she’ll accept a guaranteed job at either Ayers Rock Resort or the hotel’s management company, Accor. “That can take you pretty much anywhere in the world, because Accor is global,” she explains, proudly. While my boyfriend and I are high-fiving each other, grinning like five-year-olds and congratulating each other on making the jump, McDonnell and her Ayers Rock Resort (ARR) colleagues – all 1100 of them – are getting right into the daily grind. Humankind isn’t particularly good at many things – sharing, time travel, saying sorry – but its feats of engineering really are to be marvelled at, and the existence of ARR is a prime example. With a post office, supermarket, town square, bank, hair salon, hostel, camping ground, several restaurants and four (four!) hotels, the resort feels more like an outback town than anything else, but what’s most surprising, aside from the very acceptable latte McDonnell will serve me later, is the modernity of it all – in every sense of the word. To say it’s a different scene to the ’50s, when cheese and butter were stored in one of Uluru’s sacred waterholes, is an exercise in restraint. This year marks the 30th anniversary of handback to the area’s traditional owners, Anangu, at which point it was agreed that the park would henceforth be jointly managed by Anangu and Parks Australia. But “almost nothing” is known about the indigenous cultural significance of the park’s second major attraction Kata Tjuta, says accredited guide Michelle Whitehouse, who works for Longitude 131°. Its sacred status is the same reason why almost all commercial photography has been forbidden at Kata Tjuta (save for images shot at a certain distance), and the resulting lack of expectation makes hanging out by the entrance quite good fun. We sit for a few minutes and watch as first-time visitors, whether from Java, Japan or Australia, walk past with identical faces of amazement. By 8am, the main walk through Walpa Gorge (loosely translated to ‘windy gorge’) is buzzing with visitors, but it’s the relatively secret back entrance, via the four-hour Valley of the Winds walk, where Kata Tjuta really comes to life. Whitehouse is taking us on an edited version, to Karingana Lookout and back, but she says we’ll still see the walk’s highlights, and she just might be right. The walk’s zenith, Karingana Lookout gazes out to a series of flats that are not just beautiful but so astoundingly verdant, they could be Victorian farmland, while valleys between each bulbous mountain are equally lush: strange, dream-like patches of paradise created by a mad hatter, who perhaps started with an English countryside in mind but chose delirious colours to paint with, gleefully upscaling and warping dimensions as he went. The more accessible Walpa Gorge walk, Kata Tjuta. As we admire the sound of birds twittering madly and dive-bombing the temporarily running river, two pale foreigners limply walk past, wearing unnecessary fly nets and sweating heavily. Their portable radio blasts tinny techno into the silence. Aside from their intrusion, however, the area is almost entirely free of signs of modern human life. In the peace and quiet, it is easy to imagine why this area has long been so highly sacred. Red-cheeked hikers are filtering into Longitude 131°’s reception area, accepting house-made lemon and barley ice-blocks before sinking into air-conditioned bliss, as Heather Duff begins her silk painting workshop at ARR’s nearby Desert Gardens Hotel. Her workshop is one of several on rotation at the resort, on a schedule that includes glass blowing, jewellery making, dot painting and weaving, and is surprisingly absorbing. When was the last time you found yourself lost in the task of making something for fun? If you can tear yourself away, however, you’ll find a sense of surrealism at the rock ascending to its daily zenith. Uluru is not, as pictures might have you believe, a lovely, crumbling old thing. It’s hard and smooth, pockmarked with various craters. At noon, the base of the rock feels hyperreal. Puffs of cloud sit frozen, arranged in perfect rows, under a sky that glows computer-generated blue. Trees stand tall in a series of dots and dashes; muted green morse code on a rolling wave of iron-red soil and champagne-coloured spinifex. And the masterpiece in the middle of it all – now unapologetically orange – seems so bright, in the middle of that horizon, that it almost glows. Though most guests seek out a sunrise or sunset visit, which have their own attractions to them, the rock at midday leaves an indelible mental memory. By mid-afternoon, reception at ARR’s premium hotel, Sails in the Desert, is buzzing with guests. The five star resort at Uluru, Sails in the Desert. First-day arrivals are milling about, holding welcome glasses of chilled, lemon myrtle-infused apple juice – a flavour they’ll see again later on in the year when the restaurant offers a new cocktail-making class (alongside other local flavours, such as quandong, and globally-appreciated spirits like Belvedere vodka). Kids are launching themselves into the giant pool, while parents read books on lounge chairs. Others are padding through on their way back from the city-standard day spa, easily distinguishable by their pudding legs and dazed smiles. Over at national park headquarters, however, this time of day is all business. “The days here are 30 hours long,” muses Parks Australia employee Claudianna Blanco. On hiatus from Sydney, Blanco took her position here in order to have ‘a real life experience’, and she hasn’t regretted a moment. “Every day brings rewards and challenges,” she continues, as we walk through the air-conditioned offices – the latter no doubt including management of ‘the climb’. In 2010, the park’s board of management voted to start working towards closing the 1.6-kilometre trek up Uluru’s side. It will be closed once and for all in October 2019. 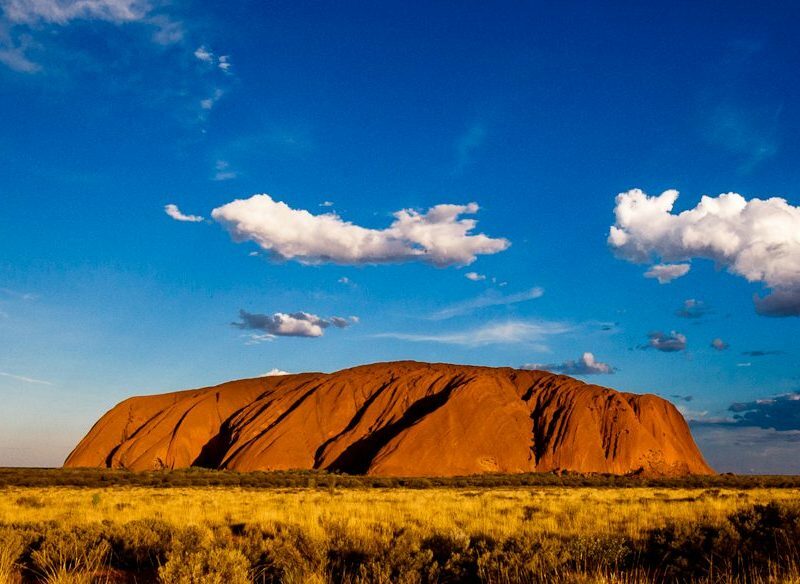 In the meantime, Anangu request people ‘please don’t climb’ through signage at the base of the rock (check out our five great reasons not to climb Uluru). “It’s for cultural reasons – the rock is sacred to Anangu – but it’s also due to environmental concerns,” Blanco explains. “Having people climb the rock affects the environment in a number of ways: erosion, litter and water pollution.” Water pollution? “People climb up, use any area as a bathroom, and when it rains, the waste flows from the top of the rock into waterholes at the base, polluting what is one of the precious few water sources for wildlife,” she says. Outside, Uluru twinkles innocently in the hazy afternoon light, deceptive in its beauty. As the sun begins its final descent, the warm air takes on a purple tinge. The rock hides beneath a blue haze now, a mirage of shimmering rust. On the back of a Harley, the warm wind slides around us like a river. Crusing Uluru by Harley-Davidson (photo: Elisse Hassey). Our Harley-riding ‘chauffeur’, Bill Sadler of Uluru Cycles, used to be a rodeo cowboy, but felt an “inexplicable” pull to come here. “I love this life,” he nods. We slip past a combi, one window papered with cloth. Three dozen more cars are lined up next to the first, their passengers settling in for the evening show with easy conversation and tinnies in hand. Two kids run around an esky. The Harley zooms by. As the next hour passes the rock will perform the day’s final encore: rust, cinnamon, crimson, rose. At this moment, however, as we round the curve of Uluru’s shadow we confront a field bright with savannah; grass strands glowing like sunlit embers of a fire. This side of Uluru is the more culturally sensitive of the two; dimpled with craters, like honeycomb, it is a sight you’ll never see in brochures. Later, when the sun has gone down and the faintest lingering pinks have left, the sky will break out in lightning. The star-gazers will gasp, the wind will sigh, and Uluru will rise again the following morning, to go through it all again.